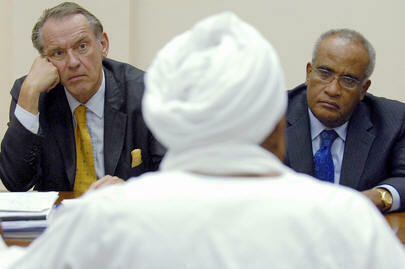 At the UN, Watered Down Plan For Darfur Force Is Promoted by Anonymous Official, to Sudan's Liking? UNITED NATIONS, June 6 -- As the outcry to get a peacekeeping force into Sudan's Darfur region grows, the UN has resorted to sleights of hand and crossing its fingers. Late Tuesday Ban Ki-moon submitted to the Security Council a "revised 'Report of the Secretary-General and the Chairperson of the African Union Commission on the hybrid operation in Darfur." The report, 31 pages and 129 paragraphs long, raises more questions than it answers. On the key question of who would be in charge of the proposed hybrid peacekeeping operation, the report essentially punts, stating in Paragraph 63 that "further clarify and agreement on the UN role in command and control will be required by UN troop- and police-contributing countries in order for them to provide personnel for the hybrid operation." On Wednesday afternoon, a briefing was provided by a person who the UN required only be identified as "a senior UN official." At the noon briefing, Inner City Press asked Deputy Spokesperson Marie Okabe to explain the need for anonymity. Let's address that upstairs, Ms. Okabe answered. But upstairs, in a room with 30 reporters, the person called what was about to be said "background, or deep background, so I can be candid." Asked about the above-quoted Paragraph 63, the senior UN official said that while public portion is vague, things are spelled out in more detail in so-called "technical documents." When a reporter called these "secret," the unnamed person said, "I did not call them that." The person noted that there are many documents the press does not have access to. Inner City Press asked the senior UN official who, then, will have access to the purportedly more specific technical documents. Will the African Union, whose Peace and Security Council has to vote, have access? Will Sudan have access? The senior UN official answered, "All and any documents on the AU/UN hybrid operation are common documents to the AU and to the UN. We are working in transparency, we share them with troop contributing countries." To many in the press corps, it appeared that the UN is trying to put off for another day the fight with Sudan about who would command the hybrid force. However, Sudan has shown a willingness to bring the process to a halt when it does not like a proposal. To some, it appears that with Ban Ki-moon having put himself on the line on Darfur, as a test of what he calls his diplomacy of the soft ear, the UN is almost desperate to appear to be making process. Several reporters asked, exasperated, weren't we at a similar point months ago? Others pointed out that revised draft is in fact weaker on UN involvement, or "more vague," which is the same thing. The senior UN official refused to agree -- and refused to be named. We'll see. The test of this particular document will come in on the 12th of June, when the UN's Department of Peacekeeping Operations will report to briefing the Security Council on the African Union's, and perhaps Sudan's, response to the revised report. On June 17, Council members will be in Khartoum. And as the senior UN official put it, even if Sudan said okay today, it would take at least 120 days to build facilities for the force -- to be built, it is said, by a U.S. contractor -- and to drill water wells. The senior UN official named four countries, two African and two non-African, which have between them committed six battalions. The names of the countries are, for now, entirely off the record. At the conclusion of the briefing, the senior UN official was asked again if any name could be attached to the quote that were provided. The answer was that proposed on the record quotes could be emailed and a response would be forthcoming within an hour. Two hours later, at deadline, there was no response. [An hour after that, a tweak of a quote with the admonition to "use the quote in a way that doesn't compromise the identity of the briefer," to which we have acquiesced.] We are left with a murky revised report, clarified only in "technical documents" which are not being provided, described by a person who by request cannot be named. We will continue on the beat.